Smoked salmon is cured in salt, and smoked for anything from several hours to several days. Smoked salmon is usually served in thin slices. The total calories in a smoked salmon sandwich depend on the bread and the spread used. 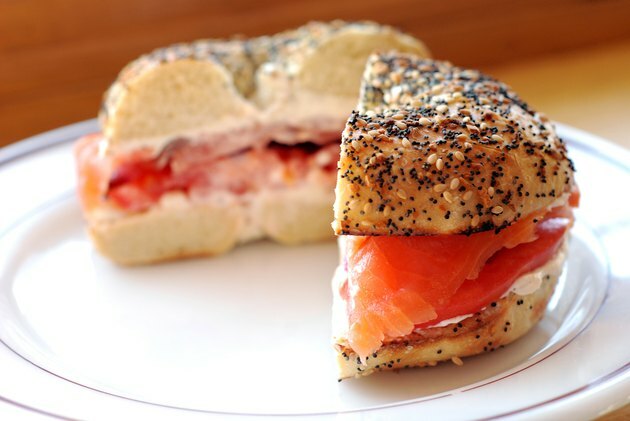 Salmon for sandwiches is usually known as lox. An ounce of lox contains 33 calories, according to the USDA's food information site, MyFood-a-pedia. A typical sandwich serving of salmon is 3 oz., making a total of 99 salmon calories. Different bread types contain different numbers of calories. For example, two slices of white bread equal 138 calories, while the same amount of rye bread contains 135 calories, and multi-grain bread 130 calories. Butter contains slightly more calories than standard margarine, with 36 compared to 34 calories. However, a low-fat margarine spread may contain only 17 calories. That means a smoked salmon sandwich could range from 246 calories to 273 calories, depending on your bread and spread choices.